You need this top video repair software if you failed to play your MP4 video footage on your video player or device. How to repair your corrupted MP4 video clips for successful playback? Check the below post! You utilize camera to record a family union video or wedding ceremony but sorry to find your recorded MP4 videos are unplayable in VLC and Windows Media Player. You spend a wonderful weekend afternoon to download funny MP4 videos from YouTube for offline watching. What makes you maddening is that the MP4 videos don't work on any video player. Other times, you convert MP4 videos to mobile device for watching on the move, but your devices tell you MP4 files are corrupted. That's quite off-putting! But the damaged MP4 can be fixed. You just need the suitable solution to repair corrupted MP4 on Mac. See, the below part comes the simple solutions to offer some tips & tricks on how to get your corrupt or damaged MP4 video file fixed for your reference. If you have another effective way, welcome to share with us via E-mail. Slightly broken MP4 videos can be definitely repaired by MacX Video Converter Pro due to its strong function of MP4 video audio repair on Mac. It could auto detect the damaged parts of MP4, extract corrupt clips from MP4, fix incorrect data, repair damaged MP4 video file, solve MP4 video abnormal playback with audio-video out of sync, delay in audio, distorted images while playing MP4, video freezes audio continues to play, or MP4 playback only audio no videos, correct MP4 interlaced image to de-interlaced one, etc. various MP4 problems. Or you can repair MP4 files on Mac with this software by cutting off the commercials or broken clips from MP4. 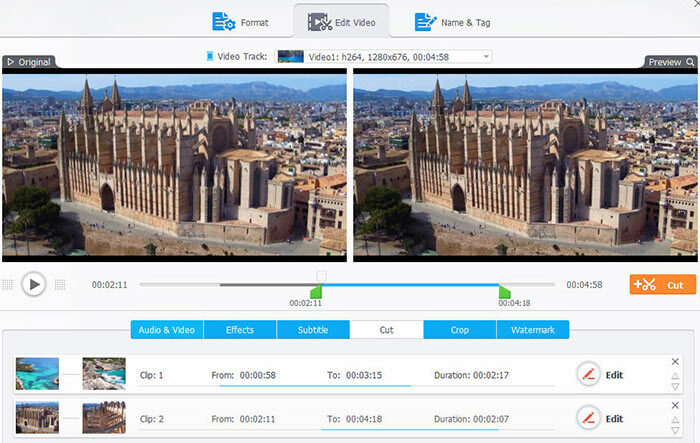 Besides, further edits like merge, crop, add subtitle/watermark are also available with this video repair tool apart from fixing corrupt MP4 Mac. Certainly, this MP4 repair software will never damage your original MP4 file on video or audio quality. 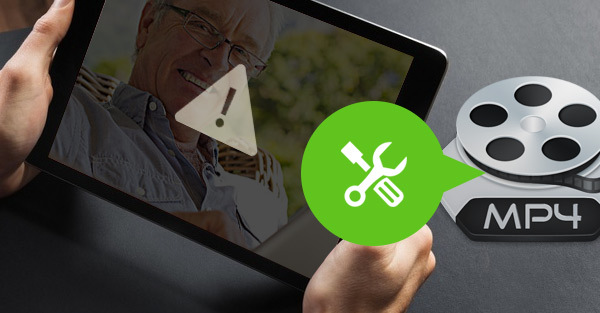 The whole MP4 repair process will be finished automatically, needless of human interaction. At the beginning, free download this MP4 video files repairing tool, install and run it to get ready for MP4 repair on Mac. 1. Click "Add Files" button to import the corrupted MP4 video file. 2. Following a series of actions of settings: tap "Cut" at the video info display zone > drag the green knob to specify the "Start Time" and "End Time" > click the Cut icon with orange color to cut off the broken MP4 video clips > hit "Done". Optional: if your corrupted or unplayable MP4 video file is mixed with commercials in middle and has different resolution or frame rate, you need to trim video length into two video clips to remove the middle commercials. And later turn on "Merge All" button to merge the MP4 video clips into one. 3. Set up file destination by clicking "Browse" button and press "RUN" to start repairing damaged MP4 files. * Tick "Deinterlacing" on the lower right corner of the main interface to change corrupted MP4 video from interlaced image to deinterlaced one to improve MP4 playback quality to a new height. * As for the distorted image while MP4 playing, you can resort to parameter settings adjustment, where you can change video aspect ratio from 4:3 to 16:9 or vice versa as you need to fit your device or video player. Plus, you can free adjust video resolution, frame rate, bit rate, etc. to at any number to correct MP4 video image. Having said that, perhaps the best software to repair your broken MP4 video file is none other than to use the best video player in the market - VLC Media Player. It comes with a built-in feature of repairing which automatically or mass fix damaged MP4 files simply. 1). 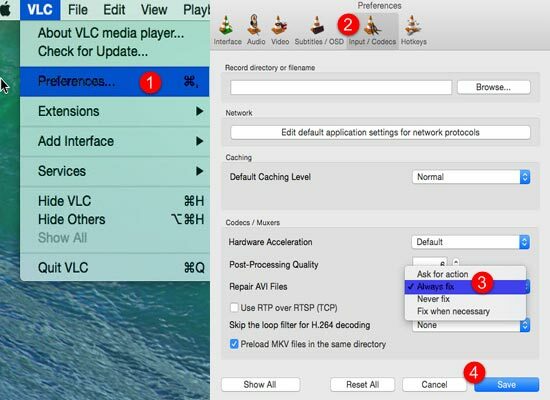 To fix corrupted MP4 on Mac, open VLC and then select "Preference". 2). Click "Input & Codecs" to load the damaged MP4 file. 3). Choose "Always Fix" > Click "Save" button, then you get your MP4 video repaired on Mac. But to be frank, VLC works better on AVI files rather than MP4. Thus sometimes it may be invalid for repairing other damaged video files like MP4, MKV etc. Only that it is a marvelous way for MP4 repair Mac trying. Efficient video repair tool for Mac to repair corrupted or damaged video files including MP4, MOV, 3GP, M4V, F4V etc. To some degree, Stellar Phoenix Video Repair is a professional MP4 repair freeware which solves various issues like sound corruption, header corruption, movement corruption, duration corruption, and change in format. In addition, it allows simultaneous repair of multiple video files. By the way, you can preview the corrupted and repaired video clicking "Preview" button during the process. If your MP4 videos are slightly damaged, you can take easy steps to fix it with MacX Video Converter Pro, VLC Media Player or some other video repair tools. Whereas if the MP4 files are badly damaged with various issues about sound, header, duration and so on, you can fall back on some specialized MP4 file repair software like Stellar Phoenix Video Repair. The selection of the tools depends on the exact degree of the MP4 files corrupted. As for me, I prefer simple repairs of MP4 video on Mac with MacX Video Converter Pro. Corrupted unplayable MP4 files may always get you in trouble even if you find ways to repair it since something superfluous is done. The best and ideal way for your MP4 videos is never get it corrupted, thus no chance for repairing MP4 files on Mac. To do so, you must make clear the causes liable for corrupting MP4 files to avoid the damage of your MP4 videos. 1. Recording MP4 video when the storage media i.e. memory card is full. 2. The original MP4 video source has something wrong in video codecs, which is unsupported by certain video players or devices. 3. The downloaded online YouTube MP4 video consists of several parts, with commercials in middle, having different resolutions and bit rate in each part. 5. Your camcorder is in insuffecient power supply when recording MP4 video. 11. Using some unreliable compression software to compress MP4 video files. 12. The video parameter settings are not correct so that your MP4 can't be played normally, with video-audio out of sync, audio delay, image distorted, etc. 1 Click to hassle-free repair damaged/corrupted MP4 video.